The Edinburgh International Book Festival is billed as the “largest festival of its kind in the world”. It takes place in August each year, in Charlotte Square at the west end of Edinburgh city centre, and is a concentrated venue for talks by numerous authors, as well as related bookshops, cafes, bars, signing tents etc. This year, the 30th anniversary event, saw apparently 225,000 visitors to the book festival over the space of a few weeks, and a rise in ticket sales over the previous year. By any measure it is a massive event. For me the strength lies in the depth of programming. The printed brochure, or online version, is perused avidly by yours truly as soon as it is released each June, and there are always too many things that I want to go to. Even picking a day at random would probably find events of interest. As it is I have to plan my visit more carefully. Because of an MS-like illness I need to take my wheelchair to the event, which isn’t really much fun by train or pushing it about the streets of Edinburgh at the height of festival season when the pavements are jam-packed with hordes of tourists. So we end up driving and staying in a city centre hotel for a couple of nights, to give me a chance to rest after the journey and before my time at the book festival. So it’s costly! But I think it’s worth it, for the time there, and the memories and experience. This year I booked us into two talks at the book festival. The first was with Neil Gaiman, who was speaking four times at the event, but I really wanted to get to his talk about his landmark Sandman series of comics and graphic novels. I read these for the first time a few years ago, and was blown away by the power of the storytelling. They’re not like most traditional comics, that focus on superheroes. Instead these are a rich tapestry of stories and ideas, and myth and legend. Quite magical. My husband hadn’t read them though, and I was a bit worried that he wouldn’t enjoy the talk so much, or might be spoiled for the stories. But he said go ahead and book it. He wants to read the Sandman in future anyway. The other talk that I booked us into was the Iain Banks celebration with Ian Rankin, Val McDermid and Ken MacLeod. I’ve only read a little of Iain’s work, but plan to read more. And I enjoyed the Crow Road TV version many years ago, and again more recently. I admire Iain’s writing skills and storytelling, and didn’t want to miss this event. The Iain Banks event was immediately after the Neil Gaiman Sandman talk, in the same venue with half an hour in between. That would be fine, and worked out really well. And because of my having a wheelchair and needing husband to help me we were able to get pre-reserved front row seats, and free admission for my husband. Fabulous. Thank you book festival! So fast forward to August 24th. We travelled down. Stayed in just about the poshest hotel in Edinburgh – if you’re going to do this you might as well do it right! Lovely meal that first night, me rest the next day, afternoon tea, then taxi, with wheelchair, at 6.30pm to Charlotte Square. That worked out perfectly. The festival site is very well laid out, in a large square formation, with tents for talks around the edge. The walkways are good for wheelchair access, and it’s generally easy to get around. The central grass area is laid out with chairs for people to sit in and drink and/or read, usually the latter whether a drink or not. And it’s just a really cheery place for a book lover to be. We browsed in the main bookshop for quite some time. As usual I bought too many books. So many in fact that we got a £5 voucher off future sales. Hubby wondered why they couldn’t have taken it off our massive spend already! But I said no problem. We’re going into the children’s bookshop next, we’ll spend it there. And we did. 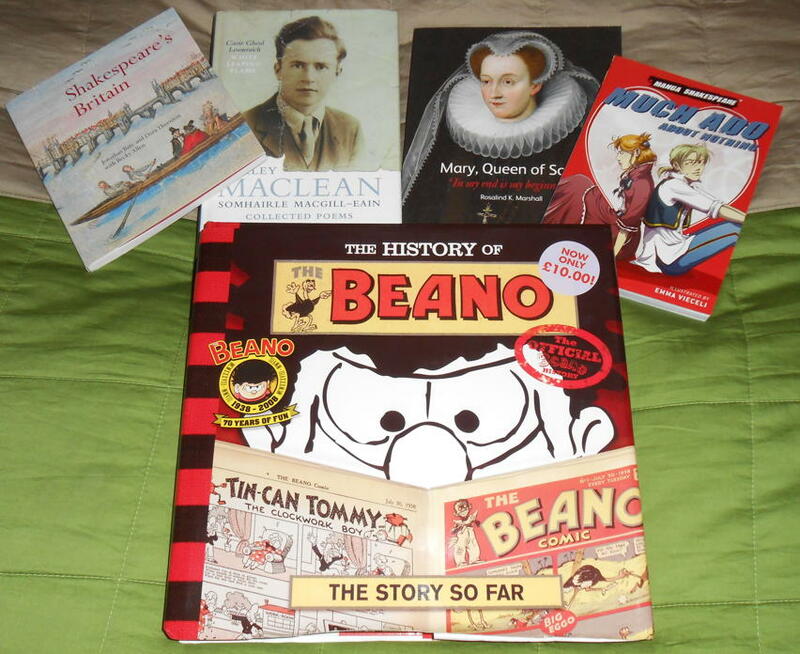 I found a history of the Beano, absolutely gargantuan, that I’ve read before, via university library copy here in Dundee, but was rather keen to own for the future. RRP £25, marked down to £10, then with our £5 voucher that meant this absolute brick cost just £5. Result! After that, lugging the heavy books with us, we wheeled round to the main theatre at the festival site, to wait for the Neil Gaiman talk that was due to start soon. Because of the reserved seats we could wait by the door. Most people were queuing all round the square. We’d seen this in previous years. It gets quite funny – and difficult to manage! – when the queue loops back on itself. Anyway the doors opened about 7.50pm and we were in at our reserved seats ready for 8pm. The Sandman talk was excellent. It was chaired by Hannah Berry, whose opening question to Neil was “How are you?” Given that he’s nearly completed a many months international book tour for The Ocean at the End of the Lane, and has been extremely tired, understandably, at times, it was really nice to hear how happy he was to be seeing the end in sight (this week), and buoyed up by this. And he was delighted to be talking to us about Sandman that night, which he hadn’t been talking about for months, so wouldn’t be going over the same ground, both for his own benefit, and for the audience. Hannah was a very relaxed presenter, prodding Neil on where necessary, though he didn’t need too much encouragement. I’m not going to cover everything that he said, but it was a wide ranging hour’s talk, particularly about the background to the creation of Sandman i.e. how he got the gig in the first place. And how he learned – starting from absolutely nowhere – how to write for comics. Some of the stories were particularly funny, for example his tale of a school careers talk, where he said that he wanted to write American comics, and the careers advisor didn’t take it too well! Anyway the audience enjoyed it, my non-Sandman reading (yet!) husband did too, and it was a great success. Sadly we had to miss the book signing afterwards because we were going to the Iain Banks event. And because of that I hadn’t brought anything to be signed, though I’d have brought The Graveyard Book if anything. Which meant that when Neil, on leaving, dashed up to me and said that he’d arrange for me to be at the front of the signing queue I was “Aarrgghh!” inside! Anyway it was extremely kind of him. Maybe next time! As it was we had a prior appointment. And the Iain Banks event did not disappoint. It was chaired by BBC Scotland political correspondent Brian Taylor, who did an excellent job. And as well as the three author friends of Iain’s, all Fifers, by birth or residence, actress Valerie Edmond, who starred in the TV Crow Road, was there to read from Iain’s work. The event was tinged with sadness, but was ultimately a celebration. It covered both the mainstream writings, particularly The Bridge, and Iain’s science fiction work, which Ken particularly talked about. Rather amusingly Ian Rankin revealed that he can’t read sci fi. He’s tried. He tried again when Iain’s cancer was diagnosed. But he just can’t, though he buys Ken’s books for his son. There was a surprise guest too. Neil Gaiman ran in halfway through, breaking away temporarily from his book signing next door, to tell us all a story about a drunken Iain antic at a world science fiction convention many years ago. The audience loved it, and Neil was really glad to be able to share the story at last. In the closing moments we saw a clip from Iain’s final interview with Kirsty Wark. I’d watched this on TV, the full-length version broadcast in Scotland, and it was very moving and powerful. The clip they chose to show at the end of the book festival talk was Iain talking about how happy he was with the different types of writing he was able to do. That seemed like a perfect choice, and a very moving point to close on. 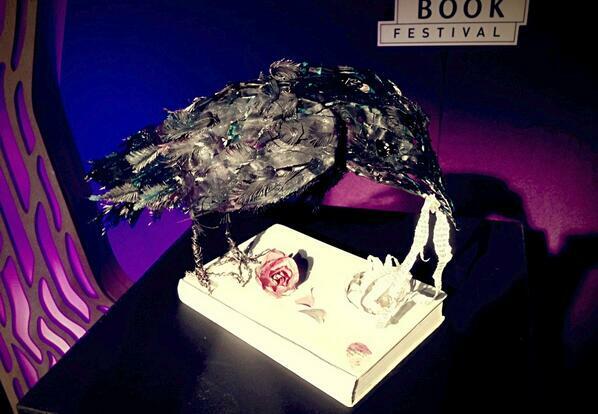 Also throughout the talk there was the crow book sculpture that had been gifted to the book festival by the anonymous book sculptor in memory of Iain. That sculpture sat on a plinth throughout the talk, for someone who’d gone away the Crow Road too soon, and would be transferred soon afterwards to Stirling University, Iain’s alma mater. We left the festival site shortly after 10.30pm and were able to pick up a taxi at the west end of George Street moments later. Then one more night in the hotel, and back home the next day. It was a wonderful trip. I’m glad I made it, and I have wonderful memories. It was also nice to see a good recap of the Iain Banks event in The Scotsman newspaper the next day. I’ve just been lucky to take part in a Q&A on Facebook with Neil Gaiman for Amazon Kindle UK. He’s one of my favourite writers. I’ve seen him a couple of times talk at the Edinburgh Book Festival, and will be seeing him talk this weekend too. Vivienne Dunstan, I think ebooks are easier to use and transport than any library of books, and have the ability to be obtained immediately, but I think that an individual book is a nicer thing than a single ebook. I like holding books, when I can. So yes, I have ebooks — I had a prototype Kindle before they were ever released — and love people reading in whatever way they wish. That echoes my views to a large extent. Although I love ebooks, not least because they are easier for me to read because of disability reasons, I still buy and cherish print books. I particularly like signed copies by my favourite authors, and big coffee table highly illustrated books. So essentially I’m a fan of both formats, and expect to be for a long time. It’s nice to know that Neil is too. I blogged recently about how useful I find using a traditional pen and paper notepad. In my case it’s more a case of jotting down ideas and brainstorming when out and about, rather than for writing any type of extended drafts. I’ve just been listening to an interview on Radio 4 with Neil Gaiman, who is one of my favourite writers. And even though he is highly technical in terms of using a MacBook Air, and active on social media such as Twitter and Facebook, he still prefers to write his first drafts in a pen and paper notepad. He says that he was finding that when he wrote directly on the computer his words had a tendency to bloat, whereas when he writes in a notepad it is better quality writing. And it also prevents him from getting distracted while writing, for example ending up buying something unneeded on eBay. I know that many other writers still use traditional notepads in this way, but it was really interesting to hear some of the reasoning and thoughts behind this process. Of course my own writing is somewhat different: not fiction, but non-fiction, which leads to different structures, and a somewhat different writing process. But I still found it an interesting insight.